As the first UK club night to take residence in Ibiza over 20 years ago, Cream is joining forces with Ushuaïa to bring Creamfields to the White Island. Saturday 1 August will see Creamfields Ibiza take over Playa D’en Bossa spreading itself across the Ushuaïa Complex including Ushuaïa Club, Hard Rock Hotel and the Ushuaïa Tower. 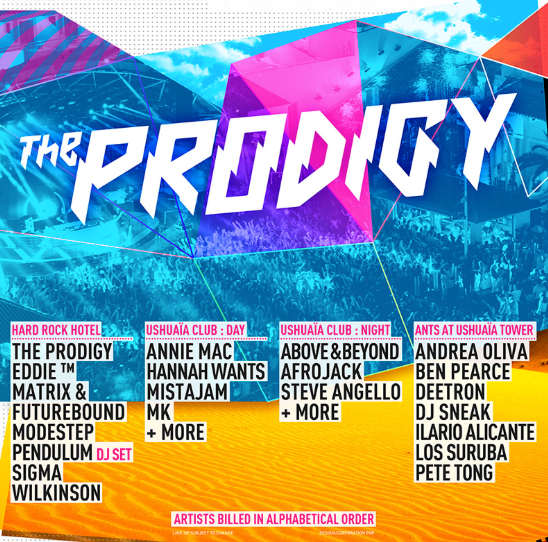 Headlining this inaugural event is one of the world’s biggest dance acts The Prodigy, a seminal act that has played an integral part in the evolution of the dance scene since the early-90s and whose live shows are legendary, they will be joined by over 25 electronic artists including Above & Beyond, Afrojack, Andrea Oliva, Annie Mac, Ben Pearce, Deetron, DJ Sneak, Eddie Temple Morris, Hannah Wants, Ilario Alicante, Los Suruba, Matrix & Futurebound, Mistajam, MK, Modestep, Pendulum (DJ Set), Pete Tong, Sigma, Steve Angello and Wilkinson.